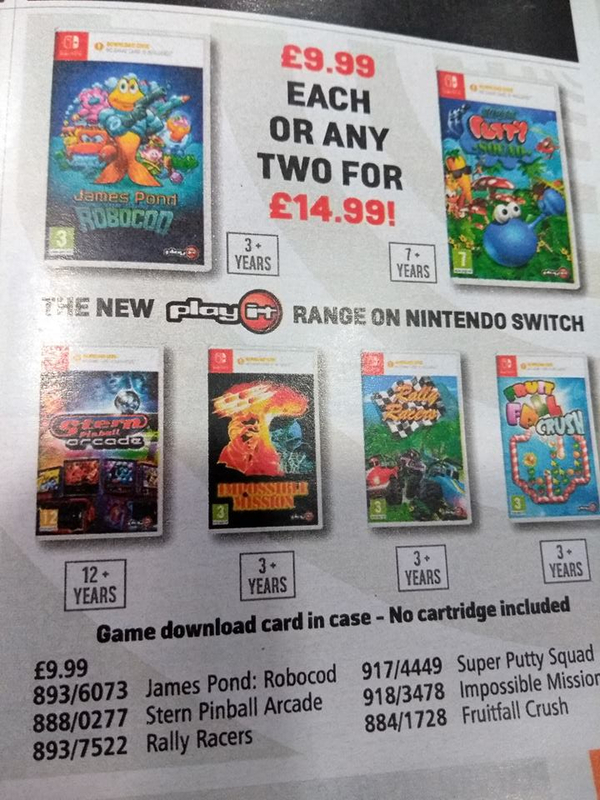 As revealed in the latest Argos catalogue, budget publisher System 3 is about to release a range of £9.99 code-in-a-box Switch titles. Ah, Argos. An unlikely source if ever there was. 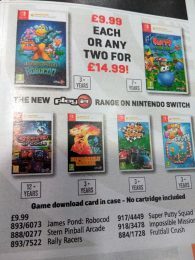 The range includes a bunch of games already available, including Super Putty Squad, Fruitfall Crush, Rally Racers, and Stern Pinball Arcade, along with two yet to be officially announced conversions – James Pond: Robocod and Impossible Mission. Both were showing as out of stock at our local Argos, and neither is listed on the high street giant’s website, suggesting the release dates aren’t set in stone yet. A re-release of the fish-pun heavy ‘90s platformer James Pond: Robocod graced the Nintendo DS in 2005, after hitting both the PSone and PlayStation 2 a few years prior. System 3 has used the Amiga CD32 version for past re-releases, and so we expect this Switch iteration to follow suit. We last saw Impossible Mission on Wii in 2008, as a reimaging of Epyx’s ‘80s hit. Curiously, this Switch re-release uses cover art from the original game. We imagine that it’s based on the Wii version though and that any changes will be minor. We’re in deep budget territory here, remember. If either piques your interest, Argos are running a ‘two for £14.99’ deal on this range. Cheap as chips, as they say. (Sorry – we’re under contractual obligation to sneak in a fish pun whenever talking about Robocod).